What’s this? An adult-orientated mainstream comedy with established comedic actors and a high-concept idea that’s… FUNNY?!?! I’m sorry, but after such lacklustre affair over the last couple of years like The House, Rough Night and Office Christmas Party, it’s shocking to see a studio comedy like Game Night actually succeed in not only being legitimately funny, with actual jokes instead of endless line-o-ramas or constant gross-out gags, but also having a plot that’s entertaining and not too ridiculous to follow, in addition to allowing its actors to genuinely throw themselves into the material and come out pretty spotless on the other side with their dignity fully intact. Make no mistake, when it comes to mainstream adult comedies nowadays, this one is a rare gem buried in the pile of dog faeces. It sets itself up fairly nicely, introducing us to competitive couple Max (Jason Bateman) and Annie (Rachel McAdams) who regularly host a game night with their friends including dim-witted bachelor Ryan (Billy Magnussen) and couple Kevin and Michelle (Lamorne Morris and Kylie Bunbury). However, when Max’s more successful brother Brooks (Kyle Chandler) comes to town, he invites the group to his place for a murder-mystery party – only for real kidnappers to suddenly show up and abduct Brooks, which the others falsely assume to be part of the set-up. Now, the group are working to solve the mystery if they are to win the grand prize of Brooks’ Corvette Stingray, but it’s not long before they discover that the situation is very real, and things only get crazier from there. It’s a humorous twist on the similar kind of plot in Three Amigos or Tropic Thunder, in the sense that it’s about a group of people who willingly thrust themselves into a dangerous situation under the false pretence that it’s all some kind of act, or in this case a game, but what makes it even funnier is how this movie is deliberately shot and sometimes directed like it’s a straightforward thriller, one that just happens to be primarily a comedy. A large chunk of the cinematography, scene transitions, how certain characters are talking etc would all be things that you would legitimately find in a movie that took itself very seriously, but this is one that mercifully doesn’t and instead goes for broke with more laugh-out-loud jokes that work than those that don’t, with fun characters that you’re willing to follow on this crazy journey, and hilarious situations that never get too unpleasant to laugh at. The contrast between the thriller and comedy aspects of the film is certainly noticeable, but it’s played up for comedic effect and makes it an even funnier watch when you see all these crazy things play out in such an over-the-top manner and yet still would buy that all of this could actually happen in a more straightforward thriller. The whole thing works as well as it does because directors John Francis Daley and Jonathan Goldstein – who with this film make a huge step up from their previous directorial effort, the so-bad-it’s-forgettable Vacation reboot – have populated it with talented comedic actors who all get some great moments to raise a laugh from the audience. Bateman and McAdams have a really strong and quite adorable chemistry together, as they work off each other extraordinarily well in scenes where both get to flex their flair for the comedic arts, especially McAdams who lately hasn’t been as able to be funny in films as her co-star but makes up for that lost time in this film. There’s some great stuff too from Magnussen as the dunce of the group, as well as Morris (who you may recognise as Winston from New Girl) who gets an amusing arc as he tries to figure out the identity of the celebrity his wife admits to sleeping to during a game of Never Have I Ever, but by far stealing every scene is Jesse Plemons, as the ultra-creepy neighbour from hell who wants nothing more for him and his thousand-yard stare to be able to participate in the game night activities. It’s with Plemons’ character that the movie embraces the kind of mystery thriller elements it is sending up, as he plays the role as though it were legitimately from a more intense movie (but he just so happens to be in a comedy) and, like a large chunk of the rest of the movie, is all the more funnier because of it. Honestly, I’m still in shock that we’ve finally gotten a good comedy in multiplexes, after what feels like an eternity of absolute crap that’s been made by the major studios over the last couple of years. The fact that Game Night is a largely successful comedy that actually has the power to make you laugh actively makes me dislike films like The House and Rough Night even more, because those films lacked the charm and whip-smart wit that this film has, and largely wasted talented comedic actors like Will Ferrell, Amy Poehler, Kate McKinnon in roles that only required them to just ad-lib and do weird things without solid enough direction. This film gets it right where so many other comedies in the recent past haven’t, in that it’s not just all about delivering joke after joke; you’ve got to have a clever idea that’s performed and executed cleverly, with identifiable characters that we like enough to laugh along with and at, and a clear sense of direction that doesn’t let it get too muddled. All of that can be found in a film where Jason Bateman chews down on a squeaky toy hamburger while having a bullet removed from his arm – never thought I’d say that with any sense of positivity! 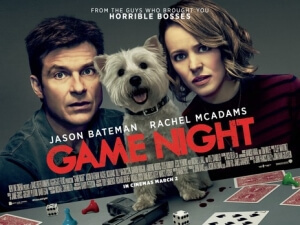 Game Night is a highly entertaining and consistently funny comedy that delivers high-stake thrills and laughs thanks to the efforts of a whip-smart script and committed actors who really embrace their funny side for this movie.